When a man is consumed by hatred, is there anything left to love? After a tough day of counseling sessions, Anglican priest Mark Webber is looking forward to a relaxing dinner at a local restaurant. When he sees who’s bellied up to the bar, though, he reaches for his cell phone to call the police. It’s Lucas Cain, the man who killed Mark’s brother three years ago. Apparently he’s out of jail and hanging out with his old crowd, which has to be a breach of parole, right? Pulled over upon leaving the bar, Lucas blows a clean breathalyzer and hopes this isn’t a harbinger of things to come. He’s ready to build a sober, peaceful life. His friends aren’t ready to let him move on, though, and he ends up taking refuge in an Anglican half-way house. 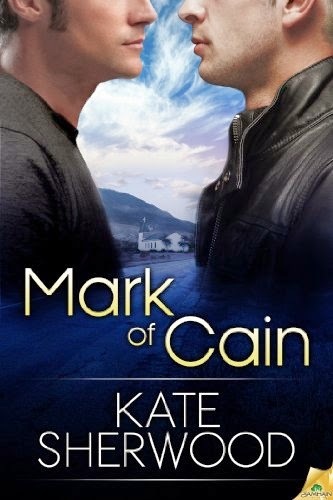 Thrown together, Mark and Lucas find common ground in the struggle to help a young gay man come to terms with his sexuality—and the fight against homophobic townsfolk. As attraction grows, the past is the last stumbling block between them and a future filled with hope. A romance between an ex-con and the brother of the man he killed? I found the idea intriguing when Sherwood posted about it on the Dear Author promo thread for authors. The premise has the potential to be pretty awful, but I liked the way the author described it. It sounded like she was actually interested in exploring themes of redemption and forgiveness. So I bought it, and I'm very glad I did. Lucas Cain is just out of prison after spending 3 years in for manslaughter. On a night out with his friends when he was 19, Lucas got into a fight, just the latest of many. He was completely wasted, and the fight ended when he hit his opponent over the head with a bottle. The man died, and Lucas was sent to prison. In there, he was a model prisoner, and he's managed to get parole. The small town he comes back to is divided on him. Many are angry that he did only 3 years, and none more than the dead man's family. This includes his brother, Father Mark Webber, an Anglican priest, who is outraged that someone like Lucas can be out so fast, when his brother will be dead forever. Lucas' old rabble-rousing friends, on the other hand, are delighted to have him back. Now they can just forget about the last 3 years and things can go back to normal: i.e. nights out partying hard and fighting just as hard. But the Lucas who came out of prison is not the same as the man who went in. He was comparatively lucky, in that he ended up in a pretty good place. Prison did the job it's meant to do, and Lucas was both punished and rehabilitated. He's come out having completely repented for what he did. He's determined to keep his nose clean and make sure he doesn't go back to prison for breaching his parole, even though part of him is not sure he deserves his freedom. After all, he's still alive, while the man he hit is dead forever. Unfortunately, his friends don't get that, and he ends up estranged from them. With nowhere to go, his parole officer arranges for him to stay at the church-run halfway house. And it just happens that it's the Anglican church that runs it, and one of the priests who's most involved in it is Mark. I think this book works so well because Sherwood takes her time. The romance doesn't start straight away. In fact, there's not one hint of romance between Lucas and Mark until almost halfway through. In that first half, both are dealing with their own issues and there are some very limited interactions between them. As I was reading (and really enjoying) that half, I wondered if having these two fall in love would not be a step too far, especially considering Mark's parents and their very uncompromising attitude. But it does work. Circumstances bring them into contact in ways that I found plausible, and they start getting to know each other almost despite themselves. They each like what they see of the person the other really is, and that slowly develops into a very satisfying romance. It was wonderfully done. I loved the romance, but this book is more than just good because there's so much more to it. I mentioned earlier that both main characters are struggling with their own issues, and those are truly different and fascinating. Lucas desperately wants to make a life for himself after jail, but it's not easy. His friends and their families are, in effect, his family, but they want him to be someone he's not, and he loses his entire support structure in one blow. It's especially hard with his friend Sean, who really does seem to care about him. And it's not plain sailing either with others in the town. I thought that was really well done, because it's a very mixed situation. There are people who will absolutely not give Lucas a fair chance (including some in the police), while others are trying very hard to help him (including others in the police, and his parole officer). And Lucas' struggles are complicated by how guilty he still feels about what he did, and how part of him feels he deserves the mistreatment. I was gripped. That said, I did feel that Lucas was maybe a bit too good to be true. Because of that, I found Mark an even more interesting character. He's having to fight his impulses to get vengeance for his brother (even if we're just talking about things like reporting to the police that this man who's on parole seems to be drinking alcohol), because it conflicts with his deeply-held ideals about redemption and forgiveness. But Mark is also dealing with issues with the way the Anglican church deals with its gay priests and, in his view, doesn't fully accept them. He does appreciate that his church is more liberal than most other churches or religions on this issue, but it is slow to make changes that go deeper than the surface fact of allowing priests to be out and continue being priests. It frustrates him that instead of making a moral decision and seeking to lead their congregation, the church hierarchy seems more interested in trying not to offend anyone. At the same time, the church is not demonised. Mark understands their point of view, and it's clear they're trying to do things as best they can, but it comes to a point where he needs to decide whether this is the right place for him. It's a thoughtful exploration of the issue, and I appreciated it. Church politics as conflict in m/m romance, who knew it could work so well? So yeah, a complete success for me, this one. Kate Sherwood seems to have a pretty long backlist, so I'm looking forward to more reads along the lines of this one, with well-developed characters and a thoughtful exploration of issues beyond the romance. If any of you have read more from her, I'd really appreciate some suggestions for where to start. Excellent review. I will definitely take a closer look. Thanks. Good :) This is one I don't think has had much buzz, and it deserves it.